If you read this book and don’t like it, lie to me and tell me you do. 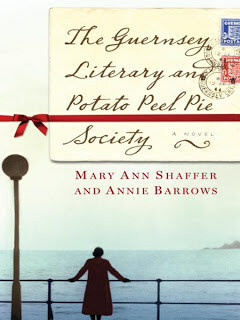 I left a little piece of myself on the island of Guernsey when I was done reading this book. The whole book is written as a series of letters from the main character to various people. The main character is an author who is looking for the subject of her next book and her search takes her to Guernsey. The characters felt so real. The tales of the hardships they went through during the German occupation broke my heart and made me want to join some sort of underground resistance even though it happened more than 50 years ago. I became friends with these characters. I could see myself planning a trip to Guernsey and finding my new friends on the street, joining in their conversations as if I had been a member of their literary society all along. This book is magical, when it was picked for our book club, I looked at the title and kind of wondered what kind of book I was going to have to read but now I find myself wishing that the library didn’t have so I would be forced to buy it for book club. I already want to check it out again, when I just barely returned it to the library’s shelf. Read it, you won’t regret it and if you do, lie to me. I don’t think I could handle people not loving my new friends. Now I really want to read this book. Thanks for the encouragment. As soon as I find time to read something I will pick it up. Love you. I also loved it! It's not a book I think I ever would have picked up (I mean, the title is confusing! ), but I really loved it. When I finished it (start to finish in less than 36 hours…), I wanted more to the story. That honestly doesn't happen with very many books for me!